NE Dev Squad February 2019 Only 63 days to go! 9:45 - athlete registration / briefing / split in to groups, which will rotate around the different sessions. There will be no swim at this session. 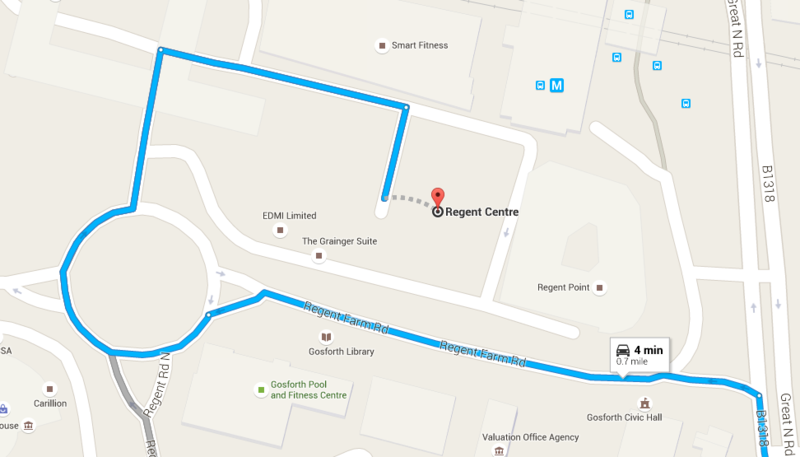 Smart Fitness is located in the Regent Centre - I've added a screenshot from Google Maps to show the way in (its not quite right, but close enough!). One of the coaches will guide you in once you're in the Regent Centre one-way system. All athletes will need bike and run kit. The bike will be in the multi-storey car park, so there's a bit of cover from weather. The sessions will be working on technique, so they'll be a bit start-stop so think about bringing extra layers if its cold. All athletes must wear a helmet on the bike. I'm assuming that athletes will be in trainers on the bike, but if more experienced athletes opt for cleats that will be OK. Please bring gloves & hat for the outdoor work. They'll also need clean gym kit for inside, ideally a different pair of trainers in case the outdoor ones get wet or dirty. Nutrition - athletes will want a water bottle when swapping between sessions and will need something to eat for lunch before the swim, as it's a long day. Please make sure that snacks won't cause a mess.